The private spaceflight firm owned by Amazon.com founder Jeff Bezos launched a suborbital crew capsule on Friday (Oct. 20), a major rocket escape system test that brings the secretive company a huge step closer to carrying astronauts. Bezos' Blue Origin company tested its so-called pusher escape system during a launch of its suborbital New Shepard capsule, which reached an altitude of 2,307 feet (703 meters) on Friday. 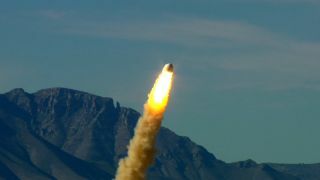 The capsule then descended safely by parachute, making a soft landing 1,630 feet (497 m) away from its West Texas launch pad, NASA officials said. The test was part of Blue Origin's work under a funded agreement with NASA's Commercial Crew Program (CCP), which aims to spur the development of private American vehicles to fill the void left by the retirement of the space shuttle fleet. "The progress Blue Origin has made on its suborbital and orbital capabilities really is encouraging for the overall future of human spaceflight," CCP manager Ed Mango said in a statement. "It was awesome to see a spacecraft NASA played a role in developing take flight." The pusher system is expected to enable full reusability of Blue Origin's launch vehicle. It's different from previous NASA launch escape systems, which pulled a spacecraft away from its rocket before reaching orbit. The New Shepard Crew Capsule escaped to an altitude of 2,307 feet before deploying parachutes for a safe return. Image released Oct. 22, 2012. Friday's launch follows closely on the heels of another milestone for Washington-based Blue Origin. Earlier this month, the company conducted a test of the rocket engine that will blast the Space Vehicle to orbit, powering it up to its maximum 100,000 pounds of thrust on a stand at NASA's Stennis Space Center in Mississippi. NASA has awarded money to private spaceflight firms in three rounds, one each in 2010, 2011 and 2012. Blue Origin received a total of about $26 million in the first two rounds, but it did not receive funding in the most recent selection round earlier this year. Other companies such as SpaceX, Boeing and Sierra Nevada are also developing their own crewed spaceships with some funding help from NASA. The space agency hopes at least two American vehicles will be ready to fly by 2017. Until then, the United States will remain dependent on Russian Soyuz spacecraft to ferry its astronauts to and from the International Space Station. The next Soyuz flight to the space station will launch tomorrow (Oct. 23) at 6:51 a.m. EDT (1051 GMT). You can watch the launch live on SPACE.com here via a NASA TV feed.